Xel-Ha is a spectacular eco-park located south of Akumal, about 15 minutes from our house in Akumal. It's located on the eastern coastline of the Yucatan Peninsula, the location of the Mayans in ancient times. Xel-Ha's many leisure, ecological and natural wonders offer things to do for the whole family. The beautiful open-sea aquarium allows visitors to see sea life in its natural abode unaltered and undisturbed. Swimming with the dolphins is also a traditional thing to do for tourists and it is usually not available in most places. Animal and nature people like to spend time in the water with these gentle mammals, and they will have a exciting story to bring back to their family and friends! 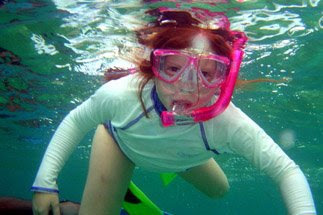 Snorkeling is also perfect in the protected lagoon. The coral is dead there, but regular feeding keeps the many types of colorful fish coming back for more. Some snorkelers will have another person feed the fish so they can see the fish from below. There is a river which starts in a natural spring, and inner tubes are used to float to the end. This is a relaxing complement to an afternoon nap in a hammock on one of the sandy beaches. More adventurous spirits can climb up and dive from the local cliffs in Xel-Ha, exploring the Mayan cave, and touring the local Xel-Ha ruins. These ruins are largely untouched and totally original, with a unique view into the history and architectural contributions of the Mayans. Hammock Island, Xpa, Bay of Caprices and The Beach are favorite areas for those who wish to lounge and experience the leisurely activities at Xel-Ha. Chacah Garden, the Mayan Wall, the Apiary and Plant Nursery provide unique natural locations for plant life lovers. Natural wonders are also seen at the Inlet, El Dorado Cavern, Ixchel’s Gulf, the Mayan Cave, Chaac Mangal, and many cenotes. When visiting Akumal, Xel-Ha is a short drive that the whole family will enjoy and offer a choice of activities for all. Day passes are reasonably priced. Xel-Ha is unique to the area with things to do centering around relaxation, fun and seeing ancient and natural wonders. People who like water will enjoy the inner tube ride, cliff diving and snorkeling in the lagoon. Naturalists will enjoy swimming with the dolphins and exploring the multiple forms of plant and animal life there, and those who want to know more about the historical roots of the Yucatan Peninsula have plenty of opportunity to see the Mayan ruins and see the architectural influences of that age. Our children and grandchildren usually plan on spending the whole day at Xel-Ha when they visit Akumal. There are so many activities they never get tired of going back. They enjoy riding a bicycle through a path in the jungle, jumping off the cliffs into the limpid blue sea, swimming with the dolphins, and walking through stingrays on the bottom of the ocean. This is th first year they signed up for the Sea Trek. You wear a futuristic underwater helmet that looks like deep-sea diving equipment. Sea Trek required no previous training , diving or otherwise. Instructors are close at hand at all times during the walk, helping you in every way and satisfying every curiosity concerning the aquatic walk of your life. Everyone says it was a walk they would never forget! We highly recommend you visit Xel-Ha on your next visit to Akumal. M Gravlee is a travel writer based out of Akumal, Mexico.